With just a few days left in 2017, it is a perfect time for reflection and revisiting favorites from this year as we get ready to wave goodbye to one year and welcome the next. 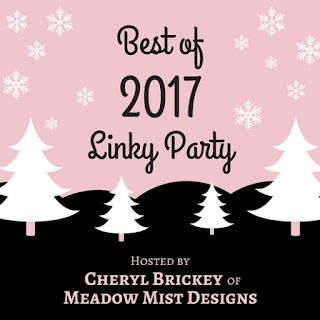 Cheryl @Meadow Mist Designs is hosting a Best of 2017 link-up to highlight our 5 best blog posts of 2017. (For reference, my 2016 post). I really love sharing my creative journey through my blog. I meet new friends and have a written record of everything that I've made. I am so glad you've come to visit! I made lots of quilts in 2017 but my favorite quilt finish is the one I made for my mom in celebration of her 80th birthday. I collected signatures and messages from everyone in the family and choose a design that highlighted the signatures. 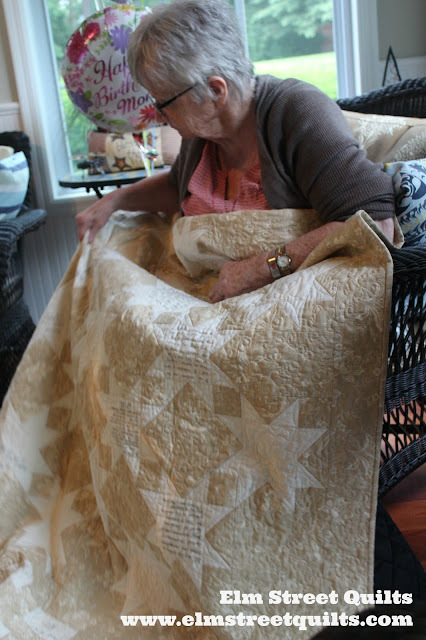 It was really special to see her put the quilt on her lap and read every message. Happy Birthday Mom! 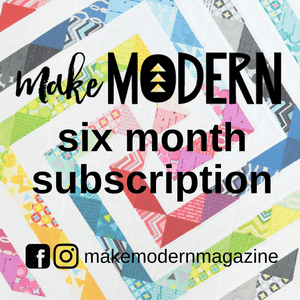 You can also read more about the process of creating a signature quilt on this quilting tip post. Every year, I run a blog link-up event called Bag It. I share new bag tutorials plus the work of some talented designers. This year's event was bigger than ever and so much fun. From my new batch of tutorials, the most popular tutorials are the Project Bag and the Sewing Machine cover. 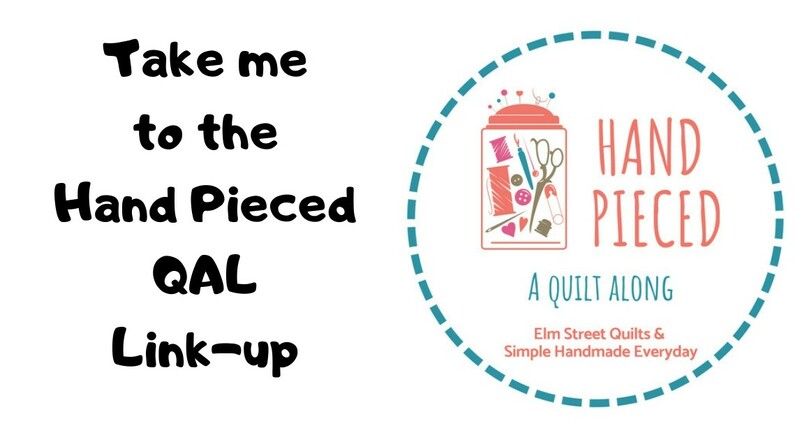 In addition to bag tutorials, I've posted other quilting tips throughout the year. 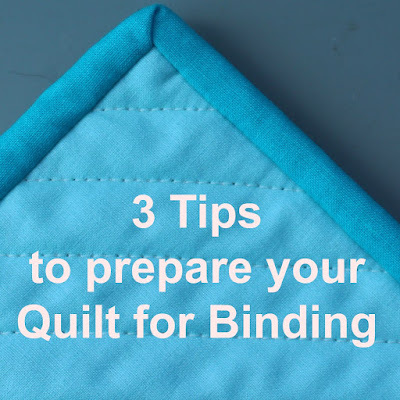 My most popular quilting tip is Prepare your Quilt for Binding. A goal from 2017 that will become even more of a focus in 2018 was to get a magazine publish of one of my designs. 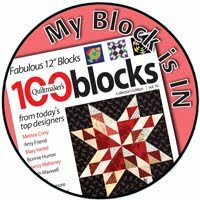 I was thrilled to be part of Quiltmaker's 100 Block Volume 16 issue with my block Scattered Triangles and it is my favorite (and only!) magazine publish. 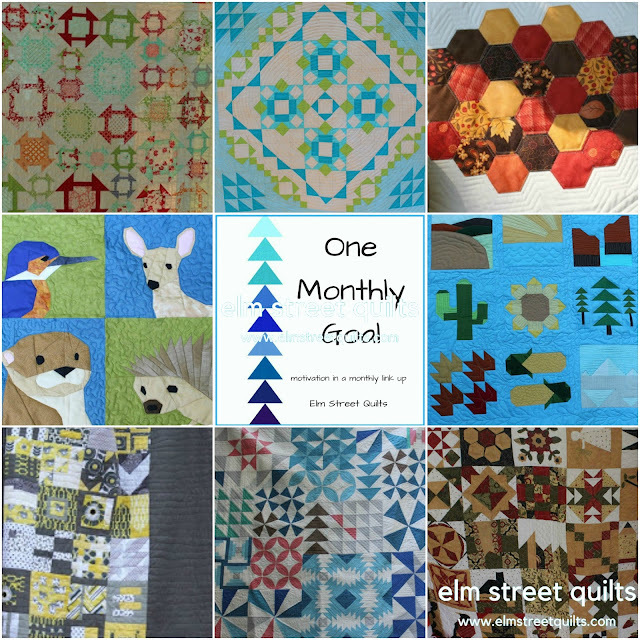 Goals for a given month need to be something associated with making with thread, fabric or yarn. You don't need to actually finish a project each month - for example, you could have a goal to make ten blocks from a project along. For this Best of 2017 post, I revisited all my monthly goals for the year and created a collage of some of the projects that were my One Monthly Goal projects. Some of the quilts I completed are pictured above - Goldilocks, Galaxy, and Autumn Hexies (top row), Woodland Animals & Our Land (middle row), Playful, Be Bold and Christmas Holly (bottom row). Thanks Cheryl for a chance to link-up! Come back on Monday, January 1 and join the One Monthly Goal link-up. I adore the quilt you made for your mom, Patty. What a beautiful year; I look forward to seeing what 2018 has in store for you! Congrats on a very successful 2017. I enjoyed following along with Bag It and the OMG is one of my favorite link ups. Wishing you a successful and joy filled 2018. Congratulations on being published. Really like the block. I will be joining you this year on OMG. I'm going for all 12 months. A goal in itself. Yay for all your accomplishments, I hope 2018 is an even bigger year for you my friend!! Great finishes, I love the quilt that you made for your mother and your Meadow Mystery quilt. Thanks for linking up and I hope you have a wonderful new year! Congratulations on your block being published ..... that must have been so exciting! Love the quilt you made for your mother, it looks beautiful! I really enjoyed joining in with “Bag It” this year.